In my last blog, you heard about my success fixing some bad connections to get my engine running again, only to then run it up to temperature and realise it was stuck in reverse gear at very high revs. The gear lever was physically immovable and I had to turn the engine off in gear � horrible! The only saving grace was that I was still tied to the pontoon when it became jammed in gear � otherwise the consequences could have been slightly different� but for now, it meant I just couldn�t go anywhere. With itchy feet and a desire to get out for a sail, the investigations began again, this time into why the gear lever was jammed. My dad, who is turning into Milestone�s resident mechanic, kindly came down to help me carry out these investigations. We looked at the connections on the gearbox itself and everything was OK at that end, so we narrowed the problem down to the morse control itself. Now, whenever you�re working on boats, the difficult part isn�t usually the diagnosis or enacting a solution. But there are always two or three bolts or screws holding something in place that are absolutely impossible to remove because the rest of the boat seems to have been built around them. This situation was the same. After what seemed like a hunt for the world�s stubbiest screw driver, Dad managed to have just enough access to coerce the cover off the back of the morse control in the cockpit. 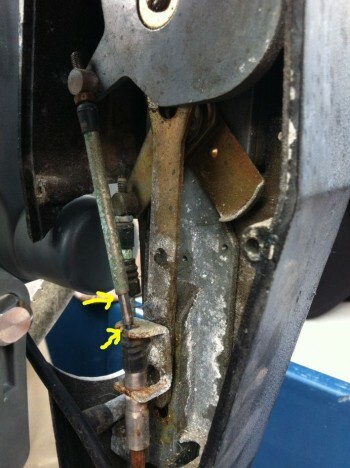 As illustrated by the two yellow arrows in the picture, the tube bit has broken apart due to corrosion and the sharp pivot angle. This then prevents the control being returned to neutral from anything more than tickover in either gear; hence why it was stuck in gear at high revs. The solution: a new morse cable. Easy, right? After purchasing a new cable from the marine engineering place here in Brighton, dad came down to help me fit it. What a nightmare! Because Miley has two steering positions (one in the cockpit and one inside in the saloon), and thus two sets of morse cables, they all go back to a control box before joining up to the gearbox/engine. This control box thing is fitted in the bilge under the chart table. Somebody has then built a floor, and a chart table, over it. Remember what I was saying about the boat being built round that one screw or nut you needed access to�? In the end, we had to remove the entire side panel in the main engine bilge to get access to it and then it was a two-person job feeling around under the floor for the right bolts to undo. Hey presto, though � after an afternoon of swearing and body contortion, the new cable was fitted, and the gear level freely moved between gears. I�m still incredibly thankful it didn�t get jammed whilst I was manoeuvring in and out of my berth; what would you do in that situation? It�s why I always like a roving fender or two on hand!